Long gone are the days where to find a decent fake tan you'd be forking out £30 a bottle for anything decent. The 'budget' end of the market is really shining at the moment. The likes of Barry M, Rimmel and Collection bringing out some excellent products for less than a fiver you can now have a bit of a beauty haul and not feel guilty. I used to be a bit wary of the cheaper tans, I pictured waiting around for smelly tan to dry that would result in a patchy mess but I know now that I was wrong. 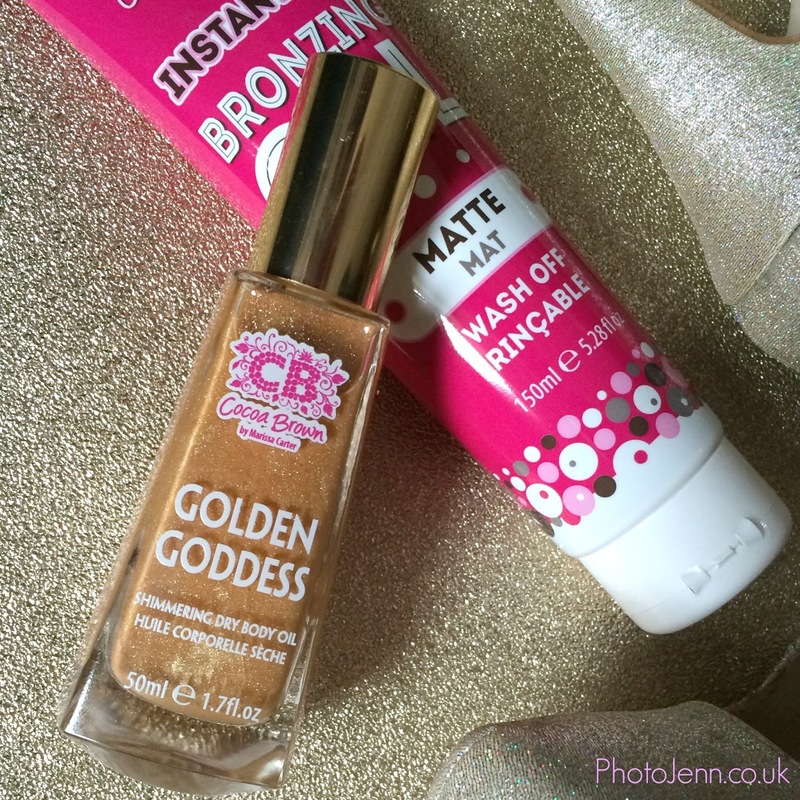 Cocoa Brown is one of my favourite beauty brands. Their Tough Stuff scrub is incredible and I recommend it to everyone. If you have stubborn old tan that just won't scrub off, try it out, trust me! I've touched upon cocoa brown 1 hour dark mousse before and this one is pretty similar. The Cocoa Brown 1 Hour Instant Tan (£7.99) is now in a squirty-cream-like bottle and this one is not in a dark shade like I tried before -though it still leaves you with a great colour. It applies like a dream and the guide colour makes it really easy to notice where you've been so you can get it nice and even. The tan is ready to rinse off after an hour but leave it up to 3 hours if you're after a deeper tan. The Cocoa Brown Matte Instant Tan Bronzing Gel £6.99 is more like tanning make-up. It's perfect for adding colour before a night/day out when you feel a little on the pale side. Or in my case, when you're tanned everywhere else but your belly is white and you quickly need to make it match as you've decided to wear a crop top. Yea, this product is perfect for that! It looks pretty dark at first - almost like chocolate! But it soon blends in. Drop a 2p sized amount on to a mitt and blend it in circular motions. It's not sticky and there's no dodgy smell. It dries very quickly so there's no worry of having to wait around for ages before you head out. But you do have to work quickly so blend blend blend! It will stay put until you wash it off in the shower so you can relax and enjoy your freshly tanned skin! Now this is the interesting one, Golden Goddess oil (£9.99) is a great alternative to the Nuxe Huile Prodigieuse gold shimmer oil and is so perfect for Summer! Used along tanned skin it looks incredible, I'm picturing a bikini, a gorgeous sunset, some cocktails, music and this baby making me look like a superstar... we can dream. It's basically a dry shimmer body oil used to enhance your tan and give you an all over glow. It is really beautiful when it catches the light so apply to any part of your body that you would want to highlight. There's a little pump that gives you just the right amount for your body, there's nothing worse than tipping out a product and wasting half of it. Now don't be fooled by the word 'oil' -yes it's an oil but that gives me visions of something slippery and greasy. This isn't like that at all, once rubbed in to the skin your skin just feels moisturised, not tacky or greasy in the slightest. You also don't look like a disco ball, the gold shimmer blends in beautifully and you're left with a subtle gold sheen when it catches the light. It's fine to use all over so you can apply to the cheekbones, brow bone, collarbones, down the front of shins, arms... just go to TOWN AND SHINE BABY! Now, this is where the magic happens. Time to use these products together. Cocoa Brown recently announced Kardashian make-up artist Joyce Bonelli as their brand ambassador. She's revealed a great technique called 3D tanning which is used by Cocoa Brown founder and fabulous business woman Marissa Carter. It sounds strange but 3D tanning is all about sculpting the body to add silhouettes and luminosity to your skin. I tried this out on my old pins which sadly had to hide away in jeans afterwards as Mother Nature has decided the Sun needs some more time off. Anyway, here's how it goes. Step 1. Apply Cocoa Brown 1 hour tan using a mitt to make sure you have a tanned base to work with. Step 2. 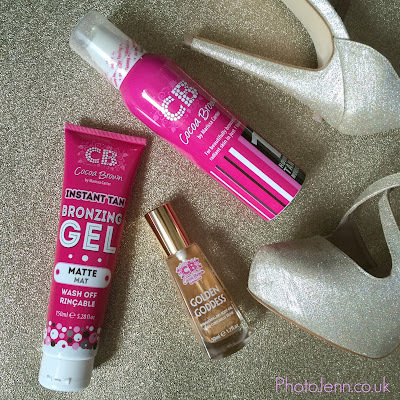 Use the instant tan matte bronzing gel to sculpt the legs. Applying the gel down either sides of legs deepens the tan on the sides and creates an optical illusion, slimming the silhouette. Just make sure you blend well to avoid and obvious stripe! Step 3. Use the golden goddess shimmering dry body oil down the shinbone. It highlights and gives skin luminosity. The legs look bronzed, slimmed and lengthened. Now all I need is the sun to come out so I can get some shorts on! What do you think of the body contouring craze? Will you be giving these products a go? So I've been away for a while. I was getting swamped with all kinds of things and I just wasn't myself. I'm making sure I take time for myself and my own health and to be honest I think blogging is a positive thing for me. I just have to try and balance life around it! That's the tricky bit at the moment. 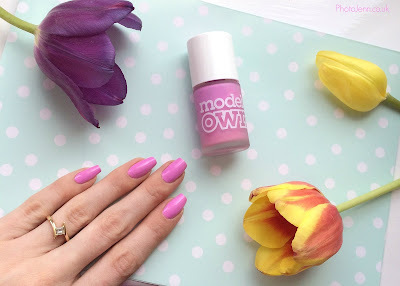 Anyway I'm back and what better way than to share with you a favourite nail polish of mine, #manimonday and all that. I'm a little late to the party with this particular Models Own collection. At the time this was released I had convinced myself that I really didn't need to buy any more pastel shades. Luckily I've come to my sense and I've found a new favourite shade in time for Summer. The Icing Collection is just perfect in my opinion. The frosted bottles give the real 'icy' feel and make me think of cupcakes. -why didn't I use cupcakes in these blog pictures? That would have been a perfect excuse to buy cupcakes! dammit. Lilac Icing is a bright lilac with a cream finish. It's almost pink but has a blue tone through it which makes it really unique. 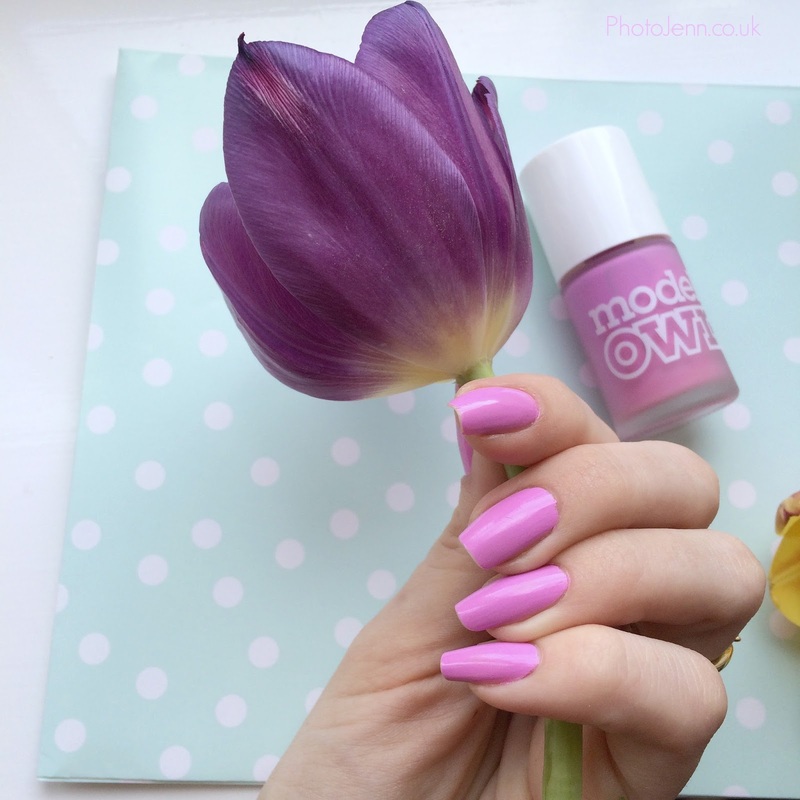 I love pastels and I love neons and this is a perfect combination of the two - I truly think this shade was made for me! Models Own have kept the names very simple so you know what you're getting pink icing being pink, mint icing being mint etc. I like that. My absolute favourite thing is that the bottles show the colour on the top which makes it so much easier to dig out of my overflowing box of nail polishes! These are available at Superdrug, Models Own bottle shops and the Models Own website. For £4.99 I think you should pick up a couple from the collection - I already have my eye on the mint one! What are your favourite nail shades for Spring/Summer?